Could Western Jews (Ash. and Seph.) descend from Aegeans and Levantine admixture? Thread: Could Western Jews (Ash. and Seph.) descend from Aegeans and Levantine admixture? I am indeed saying that the pre-Greek inhabitants of Southern Italy might already have fallen within the Eastern Mediterranean continuum. If this is true, then distinguishing Hellenic and Italic strands of ancestry will be an arduous task. The working assumption here is that the ~40% South Italian-like samples dated back to the pre-Imperial era are representative of the peninsula's ancient Oscan-speaking peoples. I have been hinting at that possibility for a few months now, and I am getting the distinct impression that there might be more truth to this educated guess than I had initially thought. To be clear, I continue to think that the earliest Italic speakers, that is to say the Proto-Italic speech community (which some Italian linguists persist in denying it ever existed) is bound to resemble the bulk of ~60% or so North Italian-like samples dated to the Iron Age and Republican period. If the Oscan-speaking peoples truly are similar to the Greeks without having any genuine Greek ancestry, then it only makes sense to assume that the Eastern Mediterranean profile was widespread long before the arrival of the Greeks and that the initial incursion of Italic languages was in many ways similar to the arrival of Indo-European speech in Bronze Age Greece. I see. But if indeed the Oscan-speaking people wouldn't resemble the Proto-Italic speech community, and rather resemble East Mediterranean people genetically, then we have to account for the fact that they (Oscan-speakers) should also resemble the Umbrians (and the Latins) in origin, given the two languages diverged from a single proto language - Osco-Umbrian - around the 1st century BC. And in any case, given the Latins also spoke an extremely close language to the Osco-Umbrians, and the Proto-Italic speech community as a whole is commonly dated to have entered the Italian peninsula circa the 19th century BC, from the North East, wouldn't that make more sense that any geneflow which might have been brought by any speakers of any Italic language would actually be North-shifting? I mean for the Oscans to resemble IA Greeks/E. Mediterranean people, you'd have to have a separate later origin for them coming into the region, speaking an Italic language closely related to Umbrian (practically originating from it). I just can't see this happening. There lies the real puzzle, in my opinion. Even if I am wrong at some level, and the Eastern Mediterranean profile turns out to be entirely associated with the coming of the Greeks - which isn't entirely out of the question, after all scores of Roman authors endlessly railed against the increased Greek presence in the Latium and heaped scorn and criticism on what they perceived to be the wholesale Hellenisation and de-Latinisation of Rome at the expense of the Roman natives during the Imperial era, and at least some of the upcoming samples are definitely bound to be Greek - the possibility that the North Italian-like samples might be a better proxy for Roman ancestry is worthy of consideration and could have very important ramifications for the ethnogenesis of Western Jewry. Note: Separated from previous period by 1000 year gap. 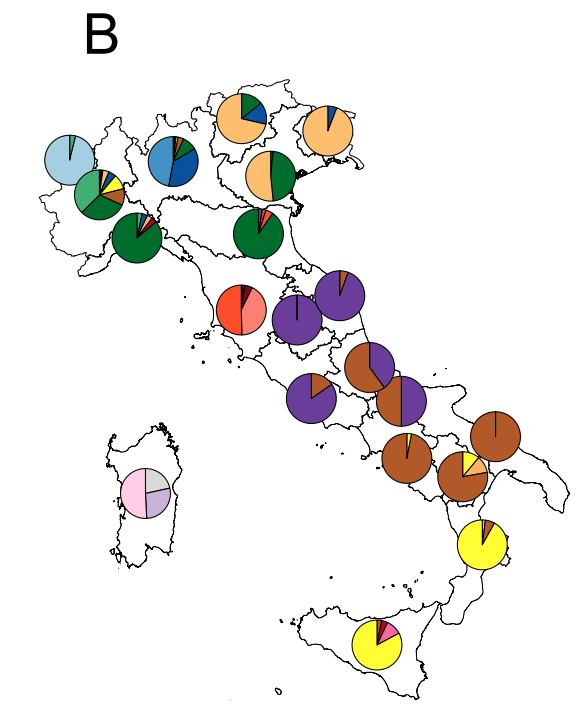 Fewer samples, of those that exist 60% overlap with North Italy, 40% overlap with South Italy and Sicily, centroid of overall cluster in central Italy but no samples occur there, very wide spread. EHG appears, Levant N Appears for the first time, sporadic and inhomogeneous distribution, Iran_N increases further. By 700 BC, it is more than possible for Greeks from Magna Graecia to penetrate all the way to Central Italy. If it was the Early IA, let's say 11th-12th centuries BC, I'd agree there's a possibility Southern Italians somehow had pre-Greek settlement East Med-like genetic profile. But given the dates, it is infinitely more plausible any Greek-like samples in Central Italy would be from Magna Graecians. We also don't know how many of these samples are after the Pyrrhic War (that is, after the early 3rd century BC), which still puts it right in the middle of the 700-20BC dating. After that war, pretty much all Magna Graecia (except for Sicily) became part of the Roman Republic, thus opening the possibility for many more Greek-like samples to appear in Central Italy and Rome. In fact, the fact that during the period in between those dates, you still have ~60% North-Italian like samples in Central Italy, only further weakens the possibility that pre-Magna Graecia South Italians (or any Italians), be it Oscans or Samnites, were East Mediterranean-like. Jews have began arriving to Rome around the late 2nd century BC, but most certainly lived there by the 1st century BC - which is right at the end of the dated period above (700-20BC) and much closer to the Imperial period, when all samples were Sicilian-like. And in any case, the Jewish community in Rome grew to become the largest one in the Italian peninsula around the 1st century AD, in the Imperial period. So I don't believe Romans they'd convert when they lived there would still be North Italian-like, again making the scenario of 50% N. Italian-like, 50% Levantine model less likely. Last edited by Erikl86; 02-10-2019 at 08:36 AM. It is probably time to really start assessing whether the old theories regarding Near Eastern admixture in Italy are still realistic. If these preliminary results are to be believed, and I see no reason why they shouldn't, then the ideas of significant Byzantine era geneflow from Armenian sources and the like are nothing more than unsubstantiated speculation. It is much more likely that a lot of the the Aegean sub-structure/genetic profile of South Italy was in place from very early on, and as Erik said, related to the Greek colonisers of that area who brought with them Iran_N/CHG and were responsible for the shift in "Sardinian" to "Sicilian". The study specifically states that Levant-related admixture in particular is found at very high levels in certain migrant samples that arrived in the Iron Age, although not the general population throughout the Imperial Period until Late Antiquity. What do we see in Late Antiquity? We see that although all Romans are now clustering well into Tuscan territory, they all have and display relatively low yet homogeneous levels of Levant_N where as before it was sporadic. The outliers are gone and there is no longer a cline leading towards the Near East, likely because the population pockets of migrant origin (Phoenician heavy towns, soldiers, traders etc.) were completely absorbed alongside a more northern population and within a couple of generations were pretty much mixed out of existence in favour of a Southern European genetic profile. 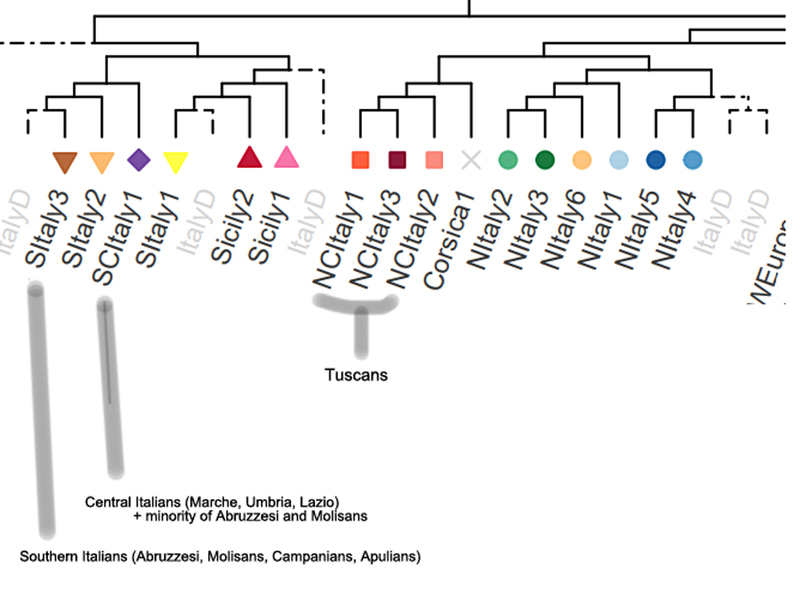 This makes it quite conceivable that most Italians except certain regions of Sicily have not absorbed a ton of direct ancestry from outside of the Italian Peninsula for a very long time. Most of it arrived in the Iron Age, and since then these relatively low but homogeneous levels have been maintained and mediated between ethnic Italians and not as a result of intrusive peoples contrary to what many like to believe. Add the existing Iran_N/CHG from before the Republic and it's pretty obvious we do not need 'Hellenized' people from Armenia and other far away lands to describe the clustering of Italians as well as their ancient profile. Even Sicilians probably derive the vast majority of their Near Eastern component from the Iron Age colonisation with some minor yet recent geneflow from North Africa. Here's a Southern Italian run using Iron Age Greek (Mycenaean), Latin (Beaker North Italy), Germanic invaders (Germany_Medieval), Iran_N (Ganj_Dareh_N), Iron Age Levant (Levant_BA_North), Arabian (Bedouin) and North African (Mozabite) to cover all bases. The main admixtures are Iran_N and Levant_BA_North. Iran_N was present from the Iron Age and continued to increase into the Republican and Imperial Periods across the entire Roman population; no need for this to be explained via recent intrusive people. Levant_BA_North representing Phoenician and/or general Levantine starting in the Iron Age and absorbed in Late Antiquity; no need for this to be explained via recent intrusive people. The only admixtures that are more recent and likely on the Byzantine timeline are Arab/North African and even then they're not significant at all. But I agree with your analysis that the cline to the Levant probably ended as a result of the fact that the significant migrations of populations with direct Levantine ancestry has ceased, and in any case, given the fact that in all periods which were sampled, such admixture is always sporadic and inhomogeneous, we can be certain that as opposed to Sicily, there seem to have been no substantial direct Levantine settlement in continental Italy, which goes along with what is historically known. Even Sicilians probably derive the vast majority of their Near Eastern component from the Iron Age colonisation with some minor yet recent geneflow from North Africa. I have to disagree - there seem to be significant Levantine component in Sicilians, both West and East, which later entered continental South Italy, especially Calabria. Prime candidates for that would certainly be Phoenicians and Punics. Given Muslim conquest of Sicily was accomplished by North African Muslims, not by Syrians or Levantine Arabs, and the language spoken in Sicily was Siculo-Arabic, which was derived from Maghrebi Arabic (specifically Tunisian dialects), AND considering Sicily was taken by Muslims in the very early Muslim era, when the Arabization of the Berbers was still an on going process and most likely at that time (8th-9th centuries AD) North African Muslims had very little Levantine admixture in them, I can't see the Muslim period as the main source of Levantine geneflow to Sicily. Of course, once it was Muslim, actual Muslim Levantines from elsewhere could have also arrived - but a more likely source would be Phoenicians and Punics, which lived on the island for centuries, and when there was a low enough population there that even small numbers of Phoenicians/Punics could have affected later generations (few thousands). We also cannot rule out that significant numbers of Ionians from West Anatolia, which included West Asian Hellenized people, have migrated and settled in Sicily and continental Italy. They would be fully Greek of course, because Greek poleis have existed in West Anatolia since the 10th century BC, but genetically speaking they might be more similar to West Asians than pre-Slavic mainland or Aegean Greeks. Last edited by Erikl86; 02-10-2019 at 12:42 PM. My mistake, I meant to say post Antiquity. I'll amend that now as to not confuse people. But I agree with you analysis that the cline to the Levant probably ended as a result of significant migrations of populations with direct Levantine ancestry has ceased, and in any case, given in all periods which were sampled, such admixture is always sporadic and inhomogeneous, we can be certain that as opposed to Sicily, there seem to have been no substantial direct Levantine settlement in continental Italy. I think that has to be the line of thinking we have going forward. Mainland South Italians do not really show the levels of Near Eastern admixture that many people speculate and I think that's because a lot of the Iran_N/CHG has not been accounted for via their Greek admixture but rather shoehorned into Armenia and so on because people confuse the clustering of modern mainland Greeks with their ancient ancestors. 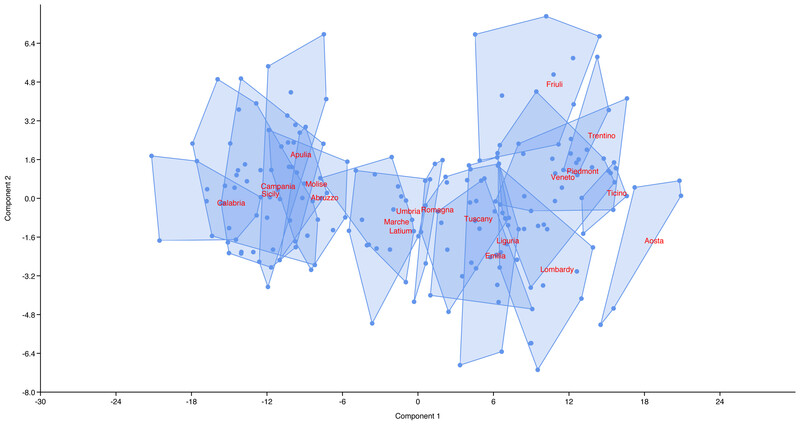 When you analyse South Italians in the Global 25, they appear to be of overwhelming Greco-Roman origin with some comparable Germanic and Near Eastern mixture that centralises their clustering. Funnily enough, when I used the Lombard samples instead of Medieval Germans as a proxy for their Germanic ancestry they showed more of that then they did Levant_BA_North, BedouinB and Mozabite combined! I don't think we're really disagreeing here. I reject migrations of North African Arabs having a large genetic impact in comparison to early settlers. These Muslims would of course be overwhelmingly "Mozabite" in the genetic sense and not Arab-proper. It is highly likely that some was diffused into the mainland from Sicily because if not South Italians would have Abruzzo/Tuscan levels of Iran_N, CHG and Levant_N but they have slightly more. Tuscans in particular, from my experience, display levels of total Iran_N/CHG/Levant_N that are generally comparable to Abruzzo but also Greece and Albania. Considering Southern Italy was probably around about similar to the rest of mainland Italy at the beginning of the Medieval Period, we can probably take those Tuscan figures as a rough bench mark level for most post Antiquity Italians and then speculate how much Iran_N/CHG/Levant_N was transferred from Sicily to South Italy afterwards, as well as how much Yamnaya/WHG was transferred to North Italy to explain the current clustering. My guess? Minimal amounts into South Italy, especially considering Sicilians themselves only display around 10% more Near Eastern than do the Central Italian samples. We also cannot rule that significant number of Ionians from West Anatolia, which included West Asian Hellenized people, have migrated and settled in Sicily and continental Italy. They would be fully Greek of course, because Greek poleis have existed in West Anatolia since the 10th century BC, but genetically speaking they might be more similar to West Asians than pre-Slavic mainland or Aegean Greeks. Here's a map of just how extensive was Greek colonization of West Anatolia, centuries before any Greek ever settled in Italy. It is more than likely Greeks which arrived to Italy from these poleis after the 8th century BC, had significant West Asian admixture, that might actually resemble Levantine in it's autosomal shifting effect (and most likely will have Levant_N in it). I am not completely ruling out a migration of Byzantine Greeks to some areas but rather stating that South Italians and Sicilians do not show significant levels of Iran_N/CHG independent of the original Iron Age "Mycenaean". This strongly indicates that migrations of Byzantine Greeks, or any other people from the likes of Armenia and so on, had negligible to zero impact. The population structure of Italians simply doesn't need such a migration to explain their clustering which is enough for me. Last edited by LTG; 02-10-2019 at 03:25 PM. It is highly likely that some was diffused into the mainland from Sicily because if not South Italians would have Abruzzo/Tuscan levels of Iran_N, CHG and Levant_N but they have slightly more. Tuscans in particular, from my experience, display levels of total Iran_N/CHG/Levant_N that are generally comparable to Abruzzo but also Greece and Albania. From your Greek-English experience based on the poor sampling of a tool? It's very unlikely Abruzzo and Tuscan have same levels of Iran_N, CHG and Levant_N. If it is shown in some amateur tool it just implies that it is not accurate, because there are clear differences between Abruzzesi and Tuscans. 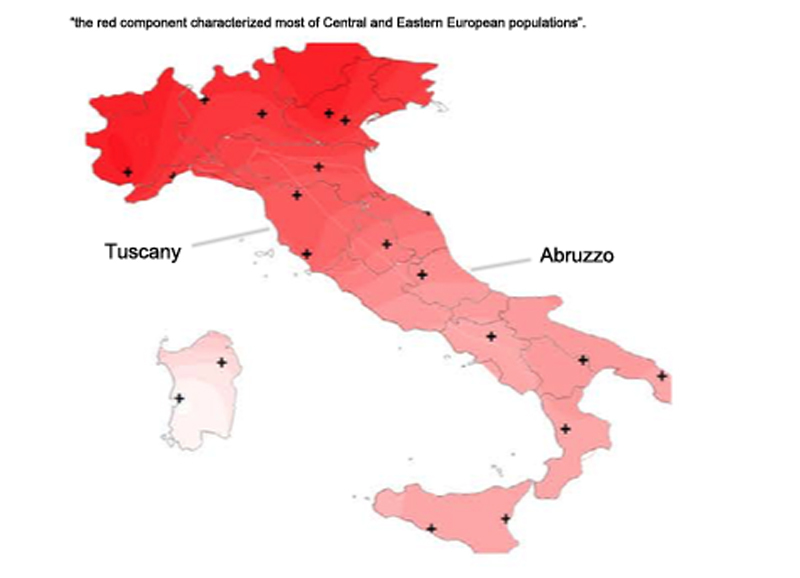 Abruzzesi join the southern Italian cluster in every decent PCA, Tuscans are more north-shifted than other central Italians as showed by Raveane et al paper 2018 and already showed by Sazzini et alia (2015). The centroid of central Italians is south of Tuscans. I am not sure what that has to do with anything. I am aware of the way that both groups cluster which is why I stated that they were generally comparable and not exactly the same. They are indeed not the same, Abruzzesi are more similar to other southern Italians. "In the region south of the Tiber (Latium Vetus), the Latial culture of the Latins emerges, while in the north-east of the peninsula the Este culture of the Veneti appeared. Roughly in the same period, from their core area in central Italy (modern-day Umbria and Sabina region), the Osco-Umbrians began to emigrate in various waves, through the process of Ver sacrum, the ritualized extension of colonies, in southern Latium, Molise and the whole southern half of the peninsula, replacing the previous tribes, such as the Opici and the Oenotrians. This corresponds with the emergence of the Terni culture, which had strong similarities with the Celtic cultures of Hallstatt and La Tène. The Umbrian necropolis of Terni, which dates back to the 10th century BC, was identical under every aspect, to the Celtic necropolis of the Golasecca culture." EDIT: Actually, the only ethnic group in South Italy that might have had East Mediterranean-like genetic profile would be... from Greece. I don't know if it's only a myth of not, but the Oenotrians in S. Italy, which are thought to have arrived there during the early IA by around the 11th century BC, were thought to be Greeks by the ancient Greeks themselves, one of the most early Greeks to actually settle in Italy. I don't know if that's accurate or not, as the 11th century BC is part of the Greek Dark Ages when credible historical account is extremely rare to non-existent. There are also theories that there was a Mycenaean presence in Italy, type of settlements, but nothing substantial except for Mycenaean artifacts which might have arrived via trade. However, if there were a pre-Magna Graecia Greek-like people in S. Italy, these would them, and in any case, they weren't native S. Italians in either. EDIT 2.0: This might be related to Strabo's claim that Greek colonization of Italy, or the foundation of the first Magna Greacia poleis, is actually dated to the Trojan War. I find it doubtful, as Greek presence in Italy is usually dated to the 8th century BC onward, but who knows. Last edited by Erikl86; 02-11-2019 at 09:27 AM. It might be also related with late bronze age expansion of sea people... Some German scientist were hypothesizing that Luwian were the sea people and they are from East part of Aegean sea from west Anatolia.